I Just Flew In From Vegas and Boy Is My Airplane Tired! Thanks for the candle. You said you made it yourself? I lit it last night after turning off the television, watching the flickering flame spark and dance so beautifully in the darkened room as I lay on the couch, slipping into that place between wakefulness and sleep where the angels whisper. As I listened, saying my prayers, mesmerized by the candlelight, I dropped off to sleep. The next thing I heard was the plaintive wail of fire engine sirens as I startled awake to the smell of burning curtains. I'd left your beautiful candle too close to the window and the entire south wall of my house was engulfed in flames. I shook my wife awake. We hastily grabbed a few things and rushed from the house. The firemen worked hard, knocking down the flaming wall to reduce the spread of the fire, but unfortunately the attic was also on fire. We have so many boxes of flammable stuff packed away up there the flames erupted like a thousand angry torches. 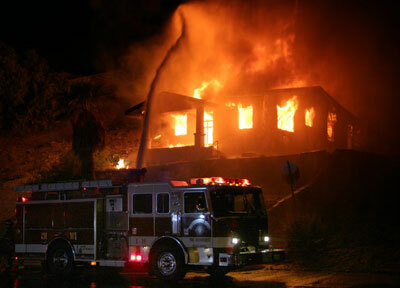 There was very little the firemen could do at this point, other than try and protect our neighbors' homes. The house closest to us (the east side) which belongs to the wonderful blind couple, did suffer some roof damage, but fortunately the firemen put it out quickly. After talking to our neighbors this morning, we learned they unfortunately suffered considerable damage to their carpet and furniture from the fire hose water and rain. Though we've known and loved this elderly couple for nearly 20 years, they said they can no longer talk to us, on advice from their attorney who we will be hearing from shortly. Cheryl and I are now living at the Howard Johnson's in Pomona. It's not like home, and the people in the next room seem to be continually fighting and shouting, but it's the cheapest motel in the area. We found a few empty syringes in the bathroom, the carpet has quite a few nasty-looking stains and the wallpaper in this room is peeling, but we are just grateful to have a roof over our heads at this point. I managed to get my laptop computer out of the house and I have internet access here, but it's hard to concentrate on this e-mail, what with the terror of last night continually replaying in my mind. This room smells like smoke, although it's probably coming from our own skin. My wife inhaled so much smoke she has to wear a breathing mask with a portable oxygen tank because of her chronic respiratory problems. We haven't had any sleep since the fire and we don't have any clean clothing. I called the insurance company this morning and for some reason I had not received my renewal notice, so unfortunately I find that my homeowner's insurance has lapsed. I'm afraid this means our house and possessions are a total loss. We lost our cars in the fire as well. Because the electric garage door motor was wearing out and would not open in cold weather, we did not have time to get our cars out of the garage. The Mercedes was a few years old, so at least I got some fun out of that car, but it is unfortunate that Cheryl had recently purchased her beautiful new Lexus -- full payment in cash. We're hoping the discount insurance coverage for the car will cover part of the loss, but I do worry about doing business with a company based in Bolivia. I'll have to take out a loan to have the debris of our once beautiful home removed so I can try and sell the vacant lot to a developer, but in these hard times for real estate, it will be practically impossible to get any money out of this property to make much of a dent in the amount I still owe on the home. I'm not sure if I can even get a loan at this point. Bankruptcy may be the best option for us. Unfortunately, we are still locked into a flexible-rate mortgage and our interest rate has risen to slightly more than 12 percent. We were barely able to keep up with the payments as things were. I wish I'd made a backup copy of my book! I was really counting on this book to move my career forward. The only copies were on computer discs and paper -- all reduced to ashes. The main copy was stored on my desktop computer which was also destroyed. It's not the sheer length of the work that bothers me (about 280,000 words) as much as the length of time it took to do the research, what with all that travel to foreign countries that I'm still paying off on my Visa card. I'd never put this much work into a book before, and I'm afraid I'm too old to repeat what has been a 12-year labor of love. We were hoping to sell some of the antique furniture and paintings we recently inherited from my family's estate that we'd stored in the house, but nothing is salvageable. And so many things accumulated from 35 years of marriage and from both of our families can, of course, never be replaced. I hate to think about all the wonderful photographs we'll never see again. At least we have our memories! Unfortunately, our two cats died in the fire, and of course, my wife is devastated. One of them was the cat my son Christopher (who is coming to stay with us for Christmas) grew up with. He was so looking forward to seeing his precious little kitty, Mr. Toodles, again. We'll have to call Chris today and break the news. After reviewing my current financial situation, I've decided the best thing to do is to try and rent a decent trailer home for the holidays, as there are a few mobile home parks in the area that are not as dangerous as some. We're going to try and find a mobile home with an extra bedroom for Christopher who is due to arrive in a few days. I'm afraid all his presents also burned in the fire, but we know he will understand. I suppose I should not have put all that cash in his stocking! It was a surprise down payment for a condominium. I foolishly thought it would be fun for him to see what $80,000 in cash looked like! I was surprised that I qualified for that home equity loan, although I suppose it was because of the high interest rate I'm being charged. It certainly will be an unusual Christmas for us, what with all of our carefully picked, expensive presents destroyed by the fire. We will just have to focus on the blessings of life itself and be grateful that we did not die in the fire -- only a few second-degree burns and smoke inhalation, although I'm afraid I may have broken my ankle while rushing to get out of the house. It is quite sore! The paramedics bandaged it last night but I refused to be taken to the hospital. I just could not face an emergency room after all I'd been through. Cheryl and I will take the bus to the clinic today. I'm using an old umbrella for a crutch. We will simply have to learn to be grateful for what we have left, even though it probably means total financial disaster. Cheryl and I now realize we will have to give up the idea of retirement and return to the workforce to try and rebuild our lives. I've already contacted Wal-Mart and they say they are hiring! A light in the storm! So, once again, dear Yolanda, thanks so much for the candle! It was so beautiful and sweet-smelling, and, in fact, it was one of the few things I managed to salvage from the fire. I have it lit now, near the window of our motel room that overlooks the laundry area. It casts such beautiful shadows against the curtains.